LONDON (Reuters) - Stocks worldwide tumbled on Friday after weak economic data from China and Europe fanned concerns of a global economic slowdown and left investors fretting over the wider impact of a still-unresolved Sino-U.S. trade dispute. The MSCI All-Country World Index, which tracks stocks across 47 countries, was down half a percent. Euro zone business ended the year on a weak note, expanding at the slowest pace in over four years as new order growth all but dried up, hurt by trade tensions and violent protests in France, a survey showed. Another survey showed French business activity plunged unexpectedly into contraction this month, retreating at the fastest pace in over four years in the face of violent anti-government protests. Germany's private sector expansion slowed to a four-year low, meanwhile, suggesting growth in Europe's largest economy may be weak in the final quarter. The data out of Europe added to weak readings from China, where November retail sales grew at the weakest pace since 2003 and industrial output rose the least in nearly three years, underlining risks to the economy as Beijing works to defuse a trade dispute with the United States. Stock markets in Europe opened sharply lower, with Germany's DAX index falling 1-1/2 percent. The pan-European STOXX 600 index was down 1.3 percent. "The data this morning out of France really hasn't helped the mood. You look at China data, you look at the flash PMIs out of France and Germany and they've really sort of reinforced concerns that the global economy is slowing down," said Michael Hewson, chief markets analyst at CMC Markets in London. "Ultimately, I think it rather questions the wisdom of the ECB ending its asset purchase programme at the end of this month. You've got Mario Draghi basically tightening into a downturn." MSCI's broadest index of Asia-Pacific shares outside Japan fell 1.5 percent. 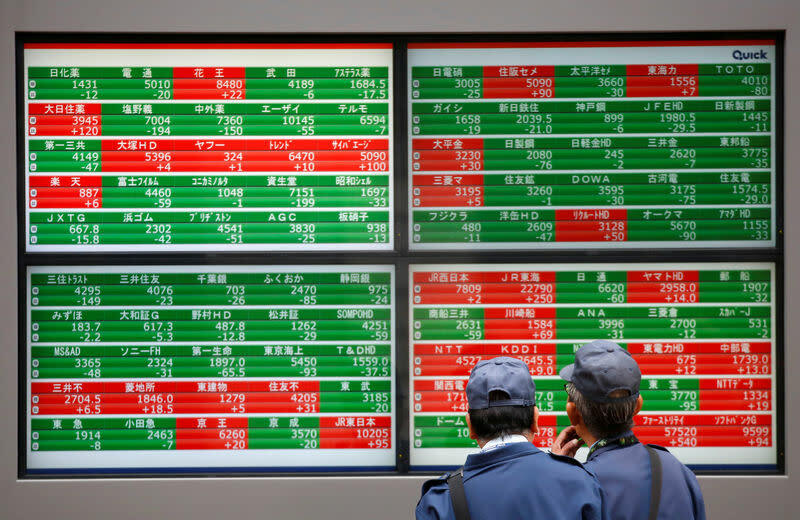 Japan's Nikkei, also dragged down by the country's weak tankan sentiment index, dropped 2.0 percent. China's benchmark Shanghai Composite and the blue-chip CSI 300 closed down 1.5 percent and 1.7 percent, respectively, and Hong Kong's Hang Seng was off 1.5 percent. A Chinese statistics bureau spokesman said the November data showed downward pressure on the economy is increasing. The data "means that the worst is yet to come and policymakers will be very worried, particularly with consumption growth falling off a cliff," said Sue Trinh, head of Asia FX strategy at RBC Capital Markets in Hong Kong. "So I expect further support measures including rate cuts will come in coming weeks, although these data would indicate measures to date aren't really working." The Chinese yuan weakened 0.4 percent to 6.9063 per dollar in offshore trade following the data. "Although hopes of progress in U.S.-China talks and cheap valuations are supporting the market for now, we have lots of potential pitfalls," said Nobuhiko Kuramochi, chief strategist at Mizuho Securities. "If U.S. shares fall below their triple bottoms hit recently, that would be a very weak technical sign." Overnight on Wall Street, the S&P 500 ticked down 0.02 percent to 2,650, not far from its 6-1/2-month closing low of 2,633 touched on Nov. 23, while the Nasdaq Composite dropped 0.39 percent. U.S. corporate earnings due next month could throw a spotlight on the impact from the U.S. tariffs on imports from China, while there is risk of a government shutdown and further political stalemate in a divided U.S. congress, Kuramochi added. In the currency market, the euro was down 0.7 percent after the weak PMIs, last changing hands at $1.1293. Sterling's rally fizzled as signs that the British parliament was headed towards a deadlock over Brexit prompted traders to take profits from its gains made after Prime Minister Theresa May had survived a no-confidence vote. The European Union has said the agreed Brexit deal is not open for renegotiation even though its leaders on Thursday gave May assurances that they would seek to agree a new pact with Britain by 2021 so that the contentious Irish "backstop" is never triggered. The pound fell 0.6 percent to $1.2615, on track to post its fifth consecutive week of losses. It was down 0.9 percent so far this week. The dollar stood at 113.48 yen, down 0.1 percent on the day but above this week's low of 112.245 set on Monday. Oil prices gave up some of their Thursday's gains following inventory declines in the United States and expectations that the global oil market could have a deficit sooner than they had previously thought. U.S. crude futures edged down 0.5 percent to $52.32 per barrel and Brent crude slipped 0.6 percent to $61.09, after both gained more than 2.5 percent on Thursday. Cryptocurrency Bitcoin fell as low as $3,200, a fresh 15-month low. A rash of bomb threats were emailed on Thursday to hundreds of businesses, public offices and schools across the United States and Canada demanding payment in cryptocurrency, but none of the threats appeared credible, law enforcement officials said.